Please join us in congratulating Jack Fairs as he is honored by the Western University Mustangs Sports Hall of Fame with a Lifetime Achievement Award. This is a second recognition as he was first inducted into the Hall of Fame in 1991. Jack will receive his award at the Western Mustangs Hall of Fame Dinner on October 19th, 2018, at the London Convention Centre. Jack was also inducted into the Ontario Squash Hall of Fame in 2005, the year of it’s inception. Please read below for his Ontario Squash Hall of Fame profile. 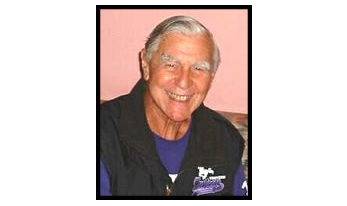 Jack Fairs has worked at the University of Western Ontario for over half a century as a teacher, mentor, researcher and coach. He is well known and respected for his extensive contributions in physical education and coaching, particularly in the sport of squash. He retired in 1988 but still continues to coach squash at his alma mater where he is professor emeritus of kinesiology. Commitment to coaching has been a hallmark of Jack’s distinguished career. Incredible as it may seem, he played and coached five sports during his lifetime: football, basketball, baseball, tennis, and squash. Even more he produced national champions in tennis, football and squash. The squash community knows Jack best for the record-setting play of the UWO squash team. Since 1970 his teams have won 32 team titles and 22 singles titles in Ontario University Athletics. Their record of 22 consecutive team and 32 titles overall make them the most successful team in UWO history. During his tenure UWO has ranked in the upper echelon of US intercollegiate squash. It won team titles in 1977 and 1980 and singles titles in 1976 and 1989. Team members have earned All-American honours and have been named to numerous All-Tournament teams. Jack Fairs’ honours and awards document his commitment to excellence in coaching and promoting the game of squash. He has been recognized by his peers, his province, his country and by the United States. In 1997 he was the first recipient of the NISRA (National Intercollegiate Squash Racquets Association) lifetime achievement award. As a teacher and coach, Jack Fairs has few equals. His work has enriched the lives of countless student/athletes. Plato said, “those having torches will pass them onto others”, and Jack has done that with enthusiasm and dedication. He has been a role model, par excellence, for aspiring teachers and coaches and continues his commitment to advancing the game of squash.